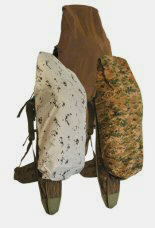 Eberlestock Reversible Rain covers are a compact and excellent addition to any pack. These double sided backpack covers are designed to cover the entire pack and weapon that's being carried, or just the pack itself so that you can pull a gun from the scabbard. The Eberlestock Reversible Pack Covers provide two Camo patterns including UNICAM II and Snow-Tech to match different environments and seasons. UNICAM II Camo, reversible to Snow-Tech camo. Approximate weight is 9 oz.